Here at Navajo Nation Chinle, Ariz., District Court where the Navajo Nation started hearing to hold respondents, who are Navajo Election Administration and the Navajo Board of Election Supervisors, in contempt of court and to issue order to show cause. We issued order to show cause for hearing today. There is certification and I’m going to ask pre-questions. Respondents served on Oct. 28, 2014. and ask counsel if that is correct. That order served to respondents and counsel? The order that was issued, the respondents were informed that this court would determine if respondents failed to comply with election code or if respondents violated duties as election officers. In contempt proceeding such as this, possible consequences be laid out if you are in contempt. That decision is to be made. Hereby inform respondents that the consequences include fines, fees, or incarceration. With that clarification, the respondents are being given opportunity to be heard. As to consequences, the respondents are election officials and there are specific laws applicable in dealing with whether official violated code, section 324, goes to qualification of election board members – “bd members must not have been found in violation in trial court or ethics and rules of the ethics laws and election law. Section 365, it is unlawful for any chairman or board members or registra or any poll judge or poll clerk or special election supervisor to knowingly or willfully to fulfil any duty in election code or accept money from anyone purporting to act on any candidate. The court wishes to inform you about why contempt proceedings are serious matter. As a reminder, to everyone, we are not here to revisit fluency qualification or disqualification of former candidate Deschene. We are here to determine if respondents title 11, section 44, which essentially requires remove name of disqualified candidate, move up qualified candidate and postpone election. We have motion from Navajo Office of Attorney General to participate as amicus curiae with supporting group. The court accepts brief of government. The brief has been read and the brief or the government, Attorney General Office, proposes that a discussion be held as to the upcoming election, he characterizes as biyee deltih instead of contempt hearing. Having accepted brief, the court will not accept proposal, we will proceed with contempt hearing. We find selves in crisis cuz respondents refused to follow your order which was very clear that Deschene disqualified, that election must be postponed to ensure valid election. Election board tried to classify court order as dt. And further, page 2, Oct. 23, 2014, ordered election office to reprint ballots and election needs to be postponed. Election Board continues to go forward with election because they are struggling over how to implement Navajo fluency qualification which is not under their authority. There is no question for Board to remove Deschene. Board is not hearing body. They have no right to make own independent decision. It is their single duty to remove disqualified candidate from ballot. This court also said, page 8 of SC opinion, requires no individual judgement by Board and Board has no authority to disregard election law enacted by Council. There must be consequences. We are not here to reargue September appeal or Writ of Mandamus. Most of respondents argument is to go back and argue. I would point to court that Board takes oath, abide by laws, preserve and protect Navajo government laws. That is the oath that they take. Title 11 mandates that Board must not have violated election code, which they have done and so we ask for removal and violation is misdemeanor which involves incarceration. This is no longer about fluency, jurisdiction, challenge of court though mob rule and intimidation to Tsosie and Whitethorne to back down. Use mob to intimidate people and everyone backs down. There must be upholding of law. We ask supreme court to ensure that presidential election not on Nov. 3, that Deschene name removed from ballot and that court consider the people be fairly represented. In Navajo tradition, there has been procedure to deal with issues and the naataanis make decision and those decisions must be respected. The court’s orders will be respected and followed and if they are not followed then consequences follow. Partner in law firm in Colorado to speak for election office and board. In reflecting on this, I want to say how uncomfortable it makes me feel to talk about Dine’ Fundamental Law. We have tried to understand and be careful what we do with it. I represent Election Board Chairperson Wallace Charley and in Council when Charley told me that what I was saying was true but the Dine’ don’t want to hear that from non-Navajo. When got out of law school, I make and still make spectacular mistakes and do best to answer. We have statutes and it’s a machine and answer comes out and if people don’t like then court can enforce by taking offices away. But Navajo courts try to do a different way of doings thing, lok for harmony and not punishment. As look at cases, look at free will of people to make choices. I’m late to party and so trying to catch. When saw motion to show order to show cause, I was shocked. 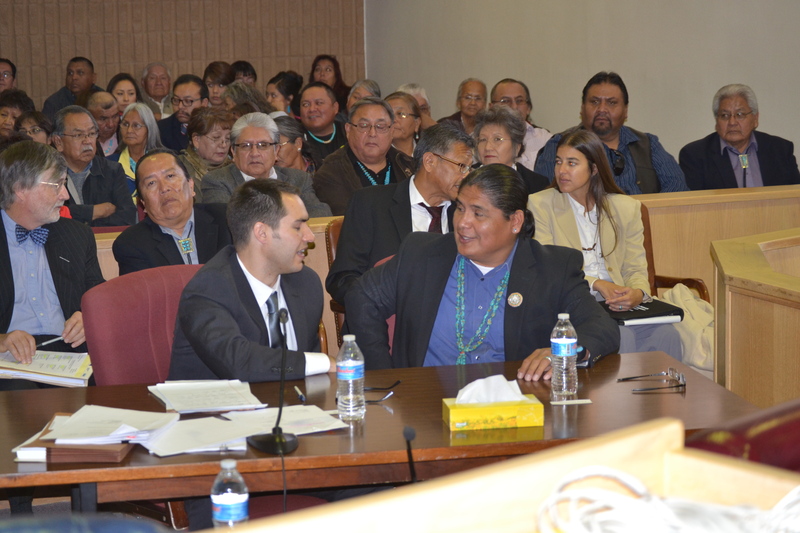 For Navajo courts to be asked to “strong arm” election office and board to comply. It was the same mistake I made when young attorney and what hear from Mr. Jordan. I hear strong sense of wrongness. I spoke briefly with Baord and they have felt same sense of wrongness. They felt wrong to postpone election but not postpone but terminate. And for thousands of Navajos that exercised free will the order was saying to board to take those votes and throw them away. Understand not about streaming word together but what does it mean to be Navajo, it’s more about cultural fluency rather than words. Board looked at decision and they felt up to people. it’s not about Richie Nez making decision if Navajo enough. Or the order that’s underlies today’s hearing, you appear to be as said in brief that court’s order is a mere opinion. No. and clarify. The board accepts board order. What order unclear about is election ongoing. Order clear that election office change ballots. How can you postpone something that is already happening. I think that in order to demonstrate that someone can be sanctioned. Mr. Boos you are saying election going on so when Early Voting happened? I don’t know. She said she voted on Oct. 13 and before Supreme Court ordered. OHA order was issued Oct. 9 and that order disqualified Deschene and expects implementation of election code. Since that day, Board has met several times, about seven meetings. The Board was aware of OHA order that indicates automatic trigger of section 44. To this day what has election office done to comply with OHA order. Remove Deschene’s name? has not happened. Ballots mailed and problem is ongoing election and issue is not about postponement but termination. Kimmith Yazzie said 8,000 people already voted. To this notion that you can’t speak to changes once election has begun. Council made law that if someone disqualified between primary and general this would happen. They never said that once ballots sent out that election could not be stopped. I’ve looked at cases, when qualifications struck down, it is about person’s personality. Whether you have been in contact in rez and that is up to people to decide. Fluency is about cultural fluency and things that are core principles. But the kinds of non-absolute rights that peole have are more objective such as run for office to often which is not about person and whether pple decide if presidential material. When stuck down qualifications, it is about what is person like and that is problem that Board looking at. In past that is what court always looked at. Court will recess and we will try to be as quick as can on this decision. Be aware that there is need for quick decision, not only cuz of another hearing but elections and conduct of Board so have to make some quick decisions. It is now 12:03 p.m.